Today is all about Haswell and Gigabyte is kicking things off with a video tour of some of their Haswell motherboard lineup. Colin from Gigabyte stopped by a couple of weeks back to show off some of the latest innovations implemented in Gigabyte's line of 8-series motherboards. With Haswell the name of the game from the motherboard makers is really polish. With the exception of FIVR (Fully Integrated Voltage Regulator), the 8-series platform is very similar to those that came before it. This gave the motherboard makers time and encouragement to focus on improving user experience as much as possible. As a result we saw tons of attention paid to improving things like UEFI, software utilities and ease of use. 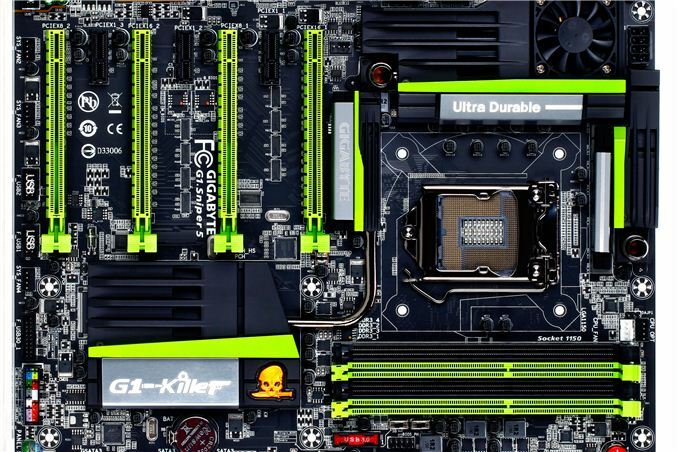 Check out the video below to see what Gigabyte did this round. You get better performance (~1%) without the PLX in a single GPU scenario - but the Z87X-OC Force has a black PLX bypass (the Z87X-OC doesn't have a PLX) if you wanted that board and only to run one GPU. With two GPUs, there is almost no difference with and without the PLX, but once you hit three then the PLX can start to make sense over an x8/x4/x4 setup when you are pushing up the resolutions. I have a feeling Anand is filming and talking at the same time. Seems like every time he is talking he can't focus on filming and the cameraworks is suffering. Can you please stop filming with a handheld Iphone. Try also to compress vital information. I managed to watch 2 minutes with fast scroll.